This one is from my grandmother’s old cookbook (Jewish Cookery, Leah Leonard, 1949) It’s a little on the imprecise side, but given that the cookbook is sixty years old, that’s not surprising. I’ve added notes where I could, and will continue to update it when possible. Please let me know how it worked and if you made any changes. 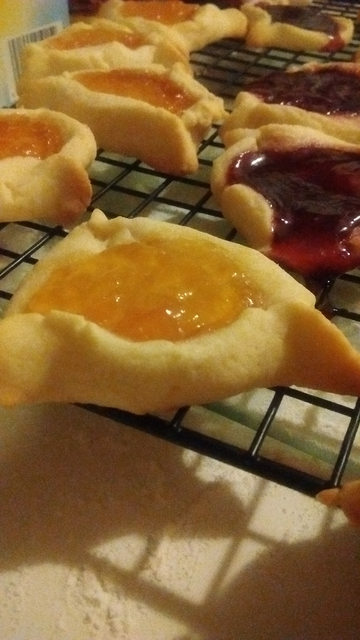 The hamentashen was tested by a nice reddit user who filled them with peach preserves, and a raspberry jam said they came out beautifully, and if you use Jam, use a little less since it tended to boil over. 2 C Sifted Flour – you might need an extra 1/2C depending on the weather and the flour. When chilled . . .
Let cool before adding eggs, beating in thoroughly. If the eggs thin it out to much, return to heat and stir while cooking 1 – 2 more minutes.